An eye stye (sty) resembles a pimple or a bump on the inside or outside of your eyelid. A stye occurs when an oil gland from the eyelid gets infected, generally as a result of a staphylococcal bacteria eye infection. Our bodies are covered with “good” bacteria, but under certain conditions, the bacteria can feast on debris and dead cells, resulting in a stye. External stye: An external stye can appear as a small pimple next to the eyelash—this “pimple” will eventually swell and become painful. It can last for several days before it bursts and subsequently heals. Internal stye: An internal stye can be found on the underside of the eyelid. It can also swell and become painful. Once the infection passes, the internal stye will simply disappear or it can leave a fluid-filled cyst that may need to be opened and drained. 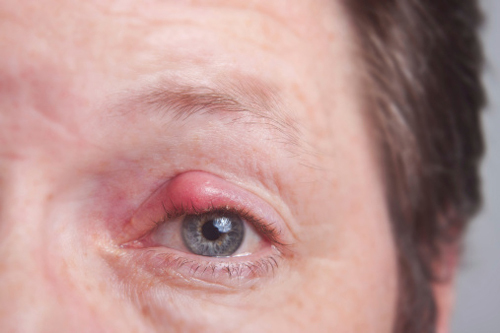 People sometimes mistake a chalazion for a stye. A chalazion is a tiny, painless bump that appears on your eyelid—it is not the cause of an infection, but rather just a blocked oil gland. If you have a stye, you don’t want the bacteria to come into contact with another person’s eye. This could cause them to develop a stye or another infection. To avoid spreading the bacteria, avoid sharing pillowcases, washcloths, bed sheets, or towels. Salt water rinse: Add a pinch of salt to two tablespoons of water. Rinse the stye with this solution (don’t touch your pupils). Repeat this process three times a day. This salt water rinse acts as an antiseptic—it will help remove dirt and bacteria from the infection and reduce the swelling. Ear wax: I know this may sound ridiculous, but it works. Take a cotton bud, scrape some ear wax out of your ear and gently place it over the stye. Ear wax may have antibacterial properties that will eliminate bacteria in the stye. Your finger: Take your little finger and rub it against the palm of your opposite hand until it becomes hot. Then place the finger over the stye and keep it there until it cools down. The heat you are transferring to the stye will prevent the infection from progressing and will encourage drainage. Make sure to wash your hands thoroughly afterward. Cool cucumber: Take a slice of cool cucumber and place it over the stye. The cucumber will soothe the eye and reduce the pain caused by the stye. Chamomile tea: Prepare a cup of chamomile tea. While it is still warm, dip a cotton ball into it. Take the cotton ball and place it over the infected eye. Chamomile has a soothing effect on the skin. This will prompt it to heal and potentially end the stye infection. Almond oil: Applying almond oil around (not in) the eyes can also help you get rid of a stye. Baby shampoo: Mix baby shampoo in warm water and wash your eyes with it. Wait a few minutes and then wash your eyes with cold water. The best part about this remedy is that baby shampoo won’t irritate the eyes. Leave the stye alone: When you get a stye, avoid squeezing it or the infection may spread. Keep your eye clean: Refrain from wearing eye makeup until the stye has healed. Don’t wear contact lenses: Use your glasses and avoid contact lenses until the stye has healed. “How To Get Rid Of A Stye,” HealthGuideHQ.com; http://www.healthguidehq.com/how-to-get-rid-of-a-styee.html, last accessed October 5, 2015. “Home Remedies For Styes,” HomeRemediesLook web site; http://www.homeremedieslook.net/home-remedies-for-styees/, last accessed October 5, 2015. “Stye: Symptoms, diagnosis and treatment,” WebMD web site; http://www.webmd.boots.com/eye-health/guide/styee-symptoms-diagnosis-treatment, last accessed October 5, 2015. Segre, L., “7 Things to Know About an Eye Stye,” AllAboutVision.com; http://www.allaboutvision.com/conditions/styees.htm, last accessed October 5, 2015.